Our tour of Guatemala started with visits to the Mayan ruins in the rain forest. Our guide watched out for wildlife and alerted us to them. 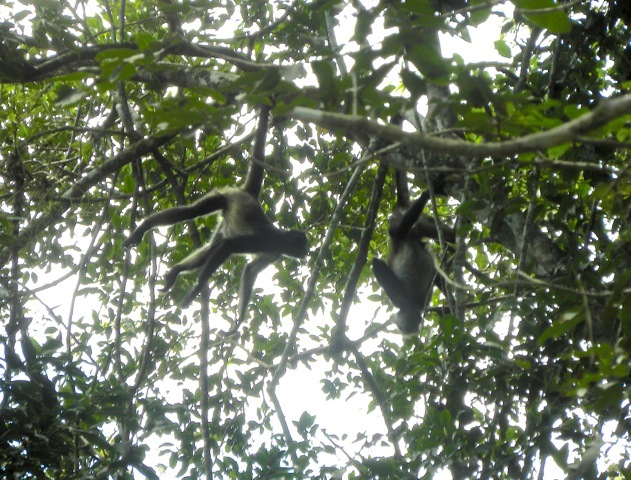 These spider monkeys frolic in the trees using their tails as their fifth limb. We walked by a pond where a sign warned us of danger. 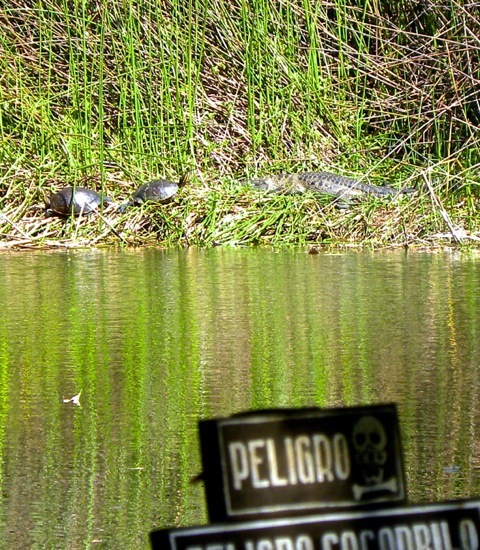 But two turtles ignored the sign and approached the crocodile sunning by the water, counting on their hard shells as protection from being eaten. 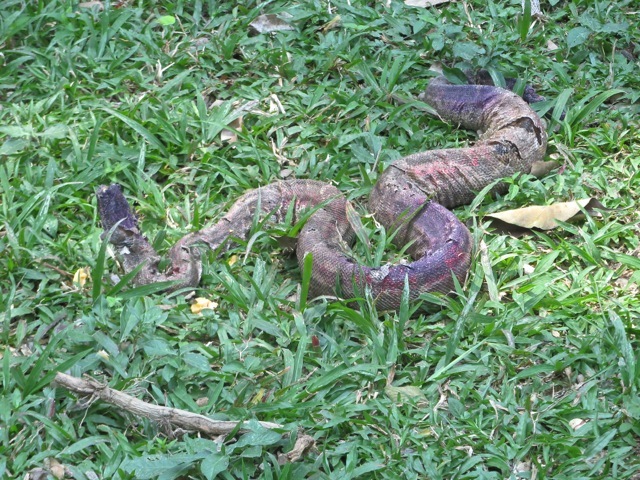 A big snake molted on the lawn of a ruins. As easter was approaching, violet banners were unfurled on buildings. They complement the beautiful violet flowers of the jacaranda trees. 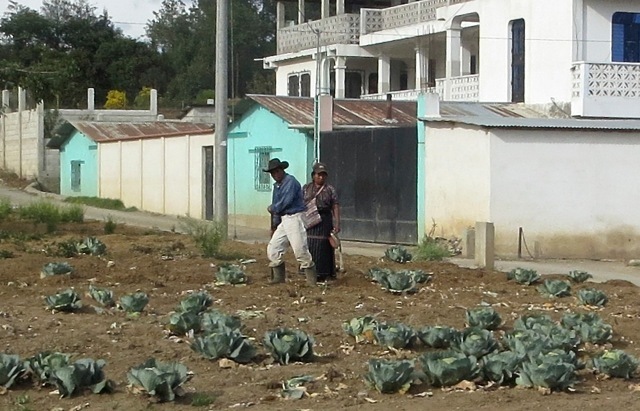 Subsistence framers practiced traditional method of planting. The man poked a hole in the ground with a stick, and the woman dropped a seed into the hole. 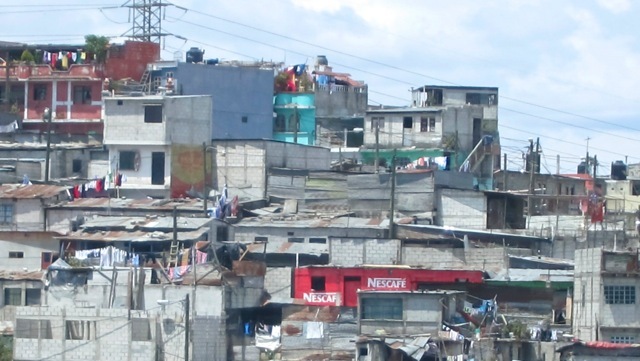 After three decades of brutal civil war that ended in 1996, many displaced farmers flocked to Guatemala City and lived in squatter neighborhoods such as this. As the slums were dangerous, our tour bus travelled on main roads only and we viewed the neighborhoods from the safety of our bus. The gated middle class community contrasted sharply with the ramshackle slum. Guatemala City felt like a besieged fortress. Almost every window and door of every house was protected by iron grates. Outside of the capital city, public security was much better and people lived much less fearful lives. 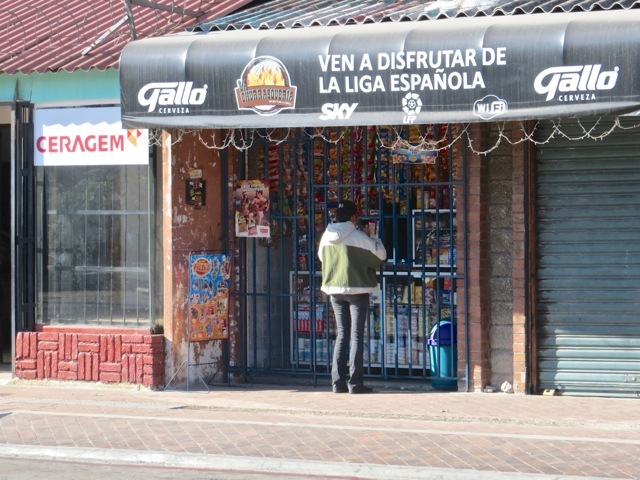 This convenient store hid behind bars. 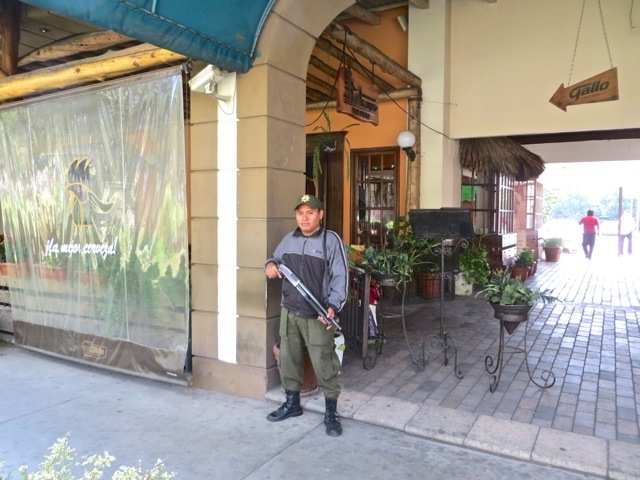 The City restaurant we ate lunch in was protected by a shotgun-toting guard. 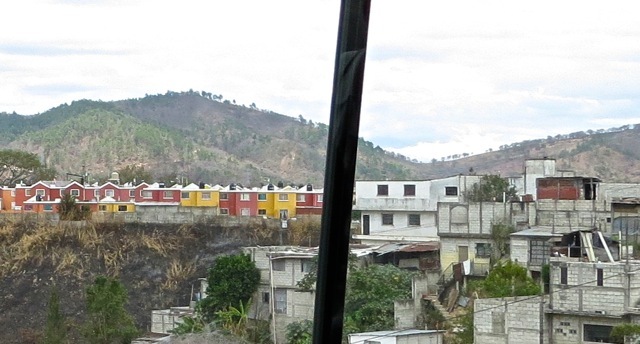 We saw more guns in Guatemala than anywhere else. The guard of a gasoline station store carried one pistol in the holster on the right side, and stuffed another pistol into his belt on the left side. He must felt insecure in his job. 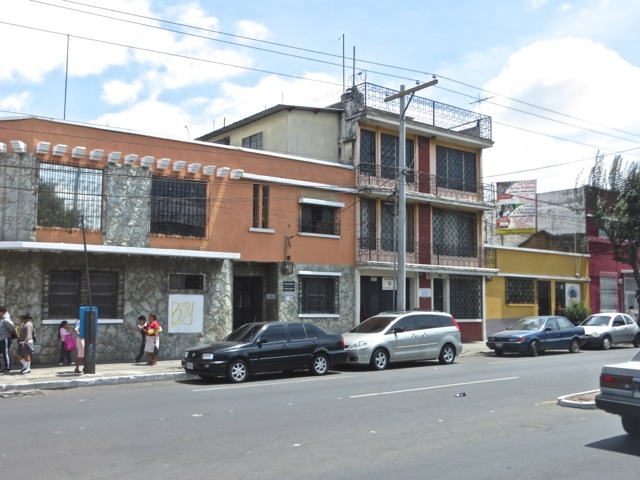 The three million residents of Guatemala City are terrorized by criminal gangs. 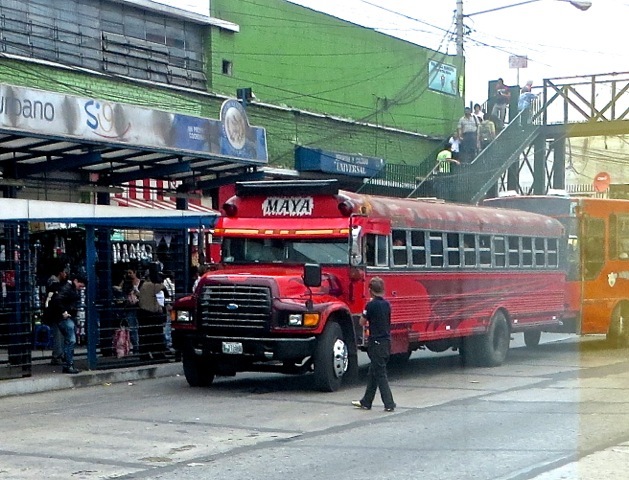 Those gangs extorted payment from privately run buses, called chicken buses, which served as the principal means of transportation. When drivers resisted, they were killed. In one year, 260 bus drivers were killed. Tragically astounding! 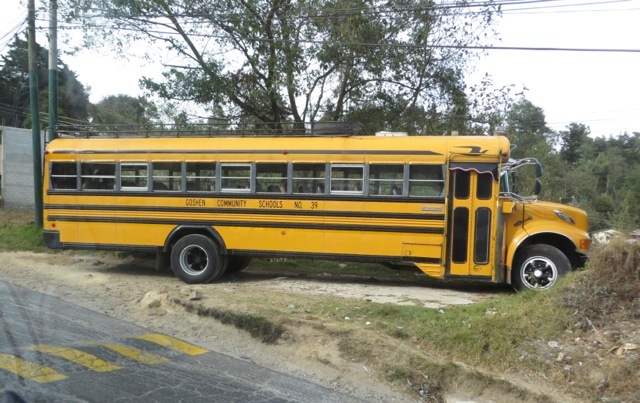 Many US retired school buses found second careers in Guatemala. They were sometimes painted and decorated garishly, but often, they were left in their original yellow paint. This school bus was from the town of Goshen, NY, where many orthodox Jews live. 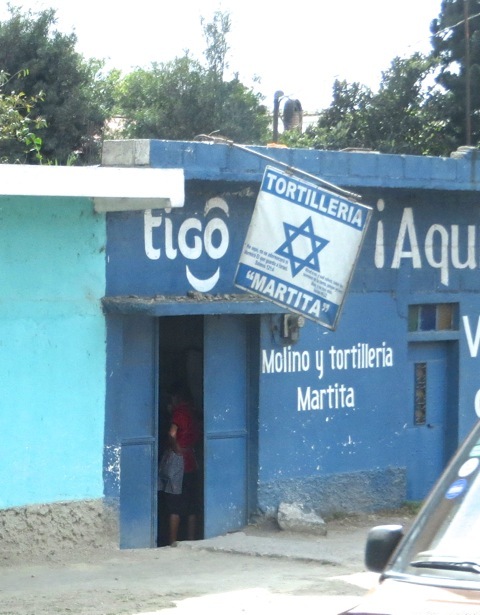 I wonder if Goshen had any influence in the establishment of this “Israeli” eatery that served (perhaps kosher?) tortillas. 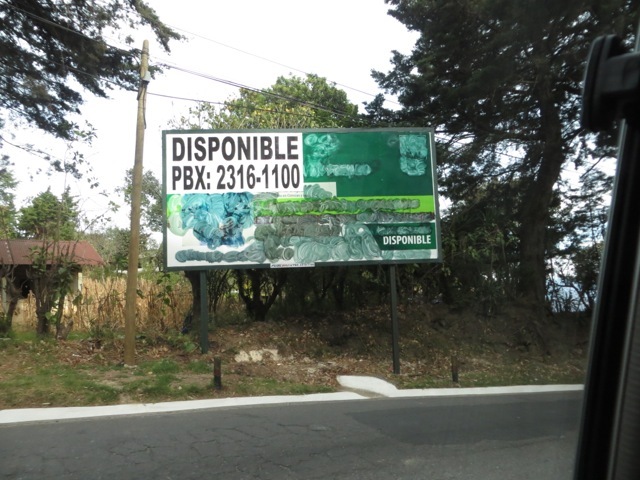 Unlike many other places, Guatemalan billboard owners did not allow advertisers to benefit from unpaid-for publicity. They obliterated expired ads as they waited for new clients. Our tour arranged a lunch at a riverside restaurant. 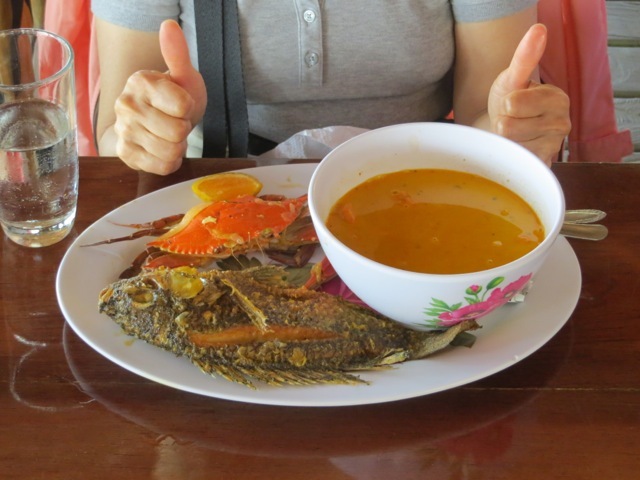 We were served an unusually delicious fried fish, a small fresh crab, and a very flavorful shrimp soup. This was the best meal of this trip and we rated it 5 stars. 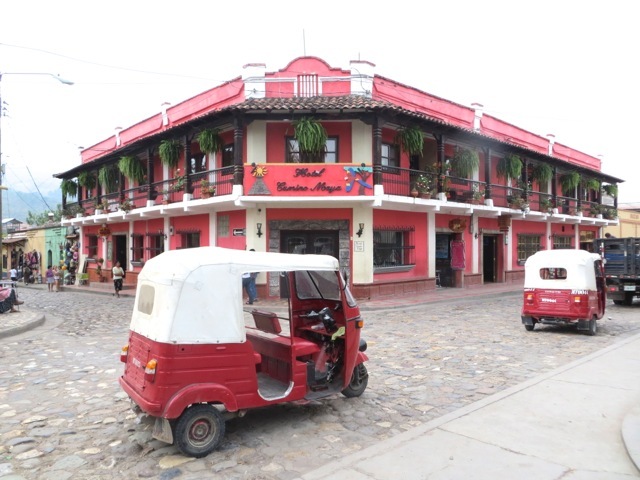 Outside of Guatemala City, three-wheeled tuk tuk taxis were ubiquitous. They were imported from India and sold for about US$5,000. 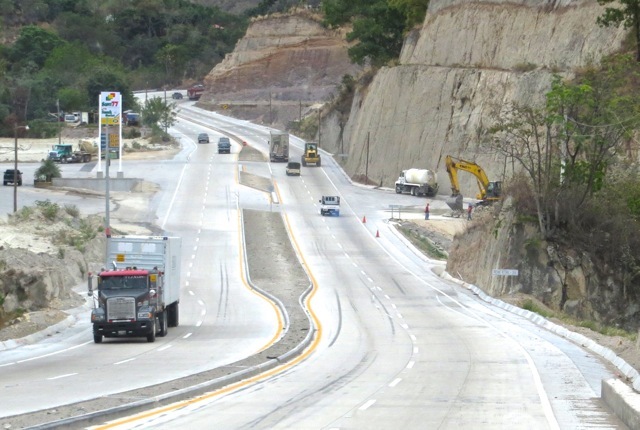 One of the few modern limited access highways is the newly-build, 50 mile road near the capital. 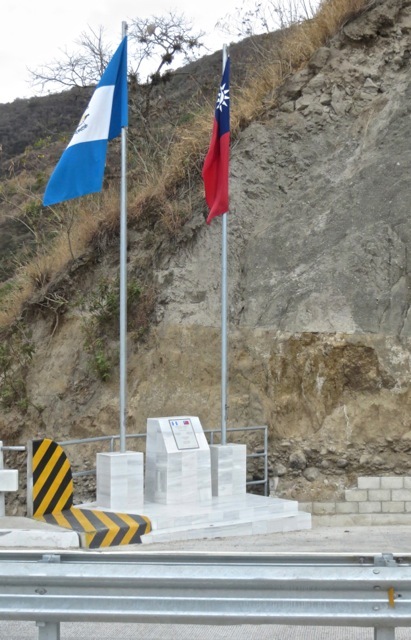 It is a gift from Republic of China (Taiwan) to Guatemala. 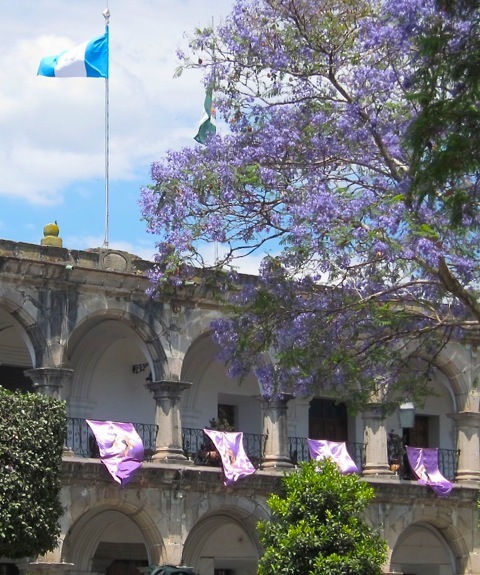 Guatemala is one of about 20 countries that maintain diplomatic relationship with Taiwan after the People’s Republic gained UN recognition. I guess this gift helped solidify the ROC-Guatemala friendship. On our way to/from Guatemala City, we made connections at the Mexico City airport. With 5 hours to kill, we explored the airport. 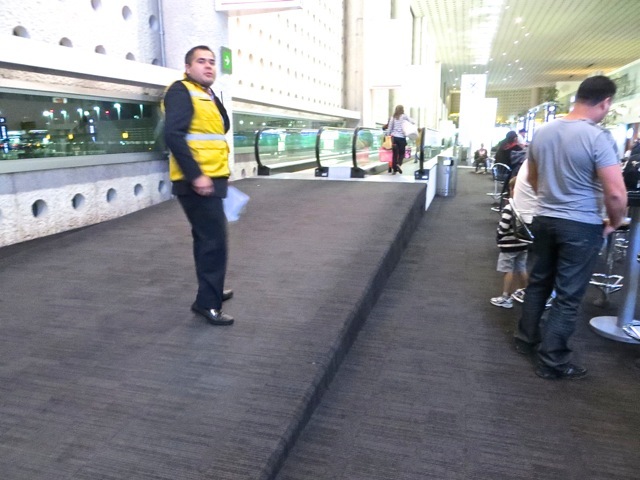 This mechanized walkway was apparently installed as an afterthought for it sat about two feet above the floor. The ramps leading to the walkway had no guards or railings, inviting accidents. 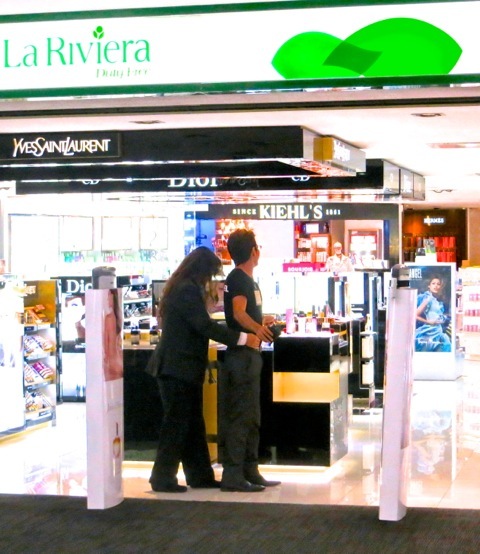 The duty-free shop in the Mexico City airport apparently had lots of employee theft. While customers could enter and depart the store freely, all its employees were searched upon leaving the store. This woman patted down every man and woman employee. 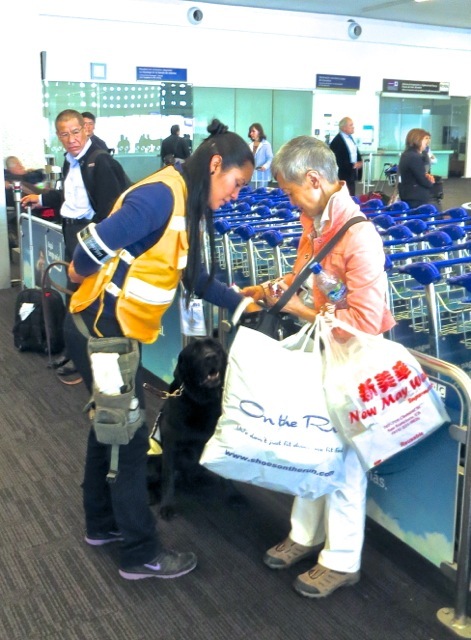 While we were retrieving our luggage in Mexico City airport, a sniffer dog picked out Sally. Sally was carrying several pillows, cushions and neck pillows to ease our long flights. Upon inspection by the dog handler, it turned out the dog was attracted to the cookies in Sally’s handbag. It must have been hungry. Woof. 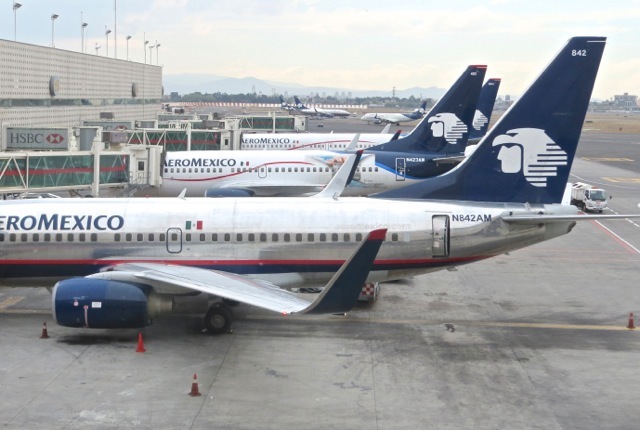 AeroMexico’s plane all have big, upswept winglets which make them look cute. I like to look out of airplane windows while on flight. 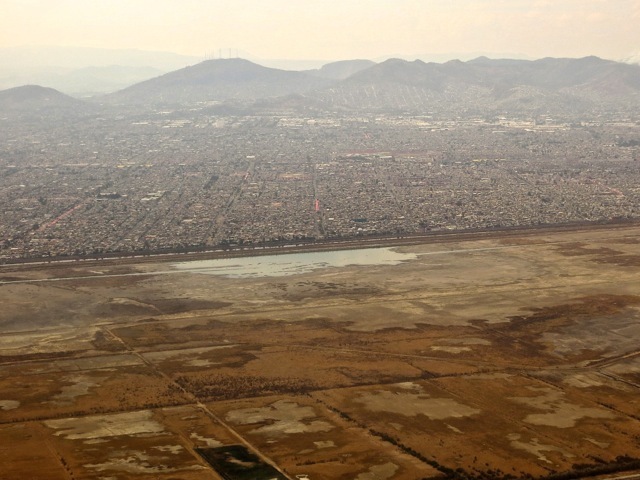 The crowded little houses in Mexico City ended abruptly at the boundary of a vacant federal land. 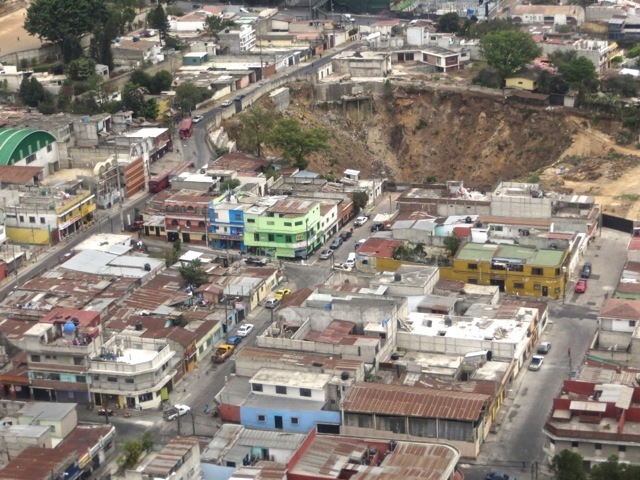 A sink hole closed off streets and threatened residents of a Guatemala City neighborhood. 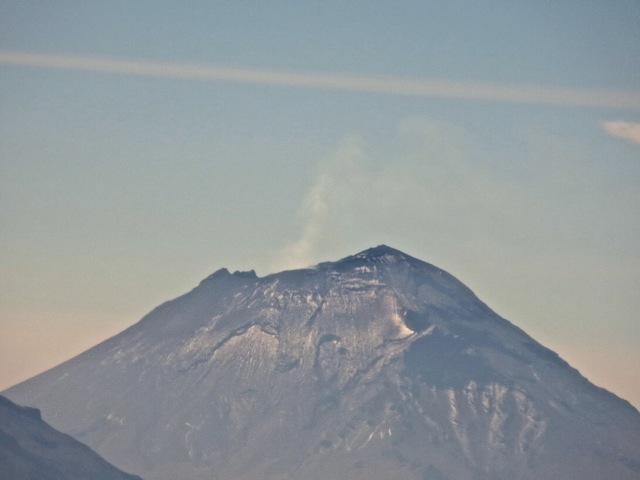 While flying over Mexico, I saw a whiff of smoke at the peak of a mountain. It looked like a volcano, but I was not sure. 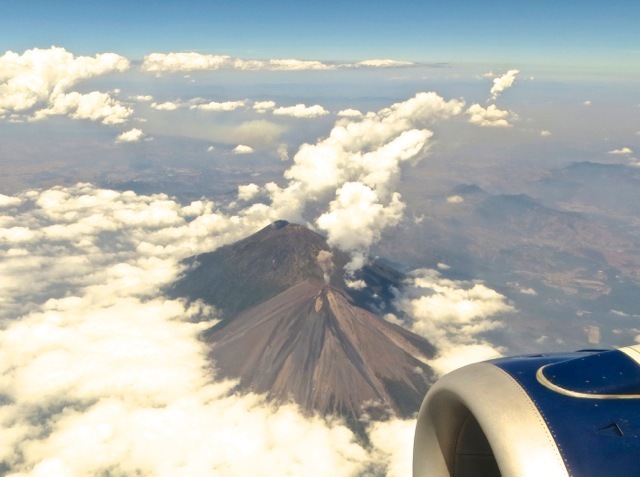 While flying over Guatemala in the return trip, I saw a definite plume of dark smoke emulating from another volcano. After some research, I believe this was Santa Maria Volcano, one of the most active volcanos in Central America. As the plane flew into the night, the land far below turned black. Then a rectangle of bright light appeared somewhere in Mexico. 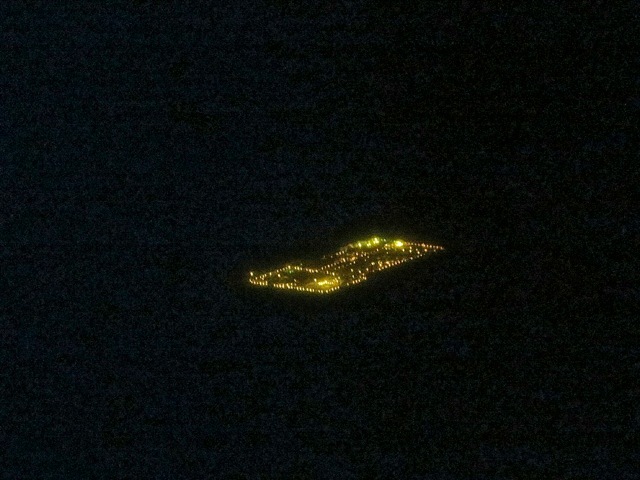 At 20 times zoom, it looked like a jail complex lit up to watch over inmates. Posted by Robert Wu on Friday, March 22, 2013, at 4:21 pm. Filed under Uncategorized. Follow any responses to this post with its comments RSS feed. You can post a comment or trackback from your blog.